CITY PLANNER Ken Bernstein speaks to neighbors at the Wilshire Country Club. 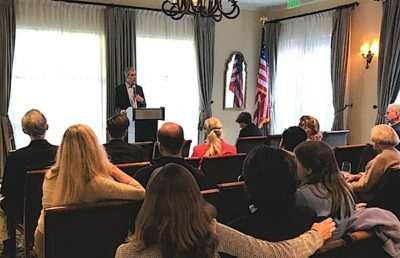 Local residents filled the Windsor Room of the Wilshire Country Club Feb. 11 to hear Los Angeles principal city planner Ken Bernstein talk on a range of issues from historic preservation to city planning. Taking the podium, Bernstein was quick to point out that Los Angeles is a city with a rich architectural heritage that includes communities whose residents care deeply about preserving their past. One of the things that surprises a lot of people, according to Bernstein, is that Los Angeles was a historic preservation pioneer, enacting one of the first historic preservation laws in the country. That said, Bernstein explained that the city lacked a comprehensive approach to actually preserving buildings until the 2006 creation of the Office of Historic Resources (OHR) within the Dept. of City Planning. Since then, the OHR, with the financial assistance of the Getty Foundation, has been working on a multi-year effort, called Survey LA, to comprehensively take stock of what is historically significant across the city. “We will have made our way, literally, down every street in Los Angeles to identify significant places,” said Bernstein. This massive effort is finally near completion with the last of the field surveys complete, and with findings on all 35 community plan areas of the city to be released shortly. The information is available to the public at historicplacesla.org, a website Bernstein encouraged attendees to explore. Following his presentation, Bernstein took questions from the audience. Referencing Metro’s creation of transient-oriented districts, such as the Purple Line subway stations on Wilshire Blvd., a guest asked Bernstein how he tries to balance the desire to increase density in those areas with the surrounding neighborhoods that already exist. “These are the questions we’re grappling with now,” answered Bernstein. The City Planning Commission (CPC) approved Miracle Mile’s HPOZ in December but changed the boundaries to exclude areas north of Eighth St., and along Olympic Blvd. Bernstein says his department did not think it was contradictory to propose an HPOZ in the Miracle Mile, even with zoning changes along Wilshire Blvd. and major corridors, because preserving that neighborhood is important and worthwhile. “But now we’re hearing from some of those neighborhoods that they’re very concerned about that decision by the Planning Commission. The event was a part of “Larchmont Living’s Distinguished Speaker Series,” presented by local Realtor Chase Campen.